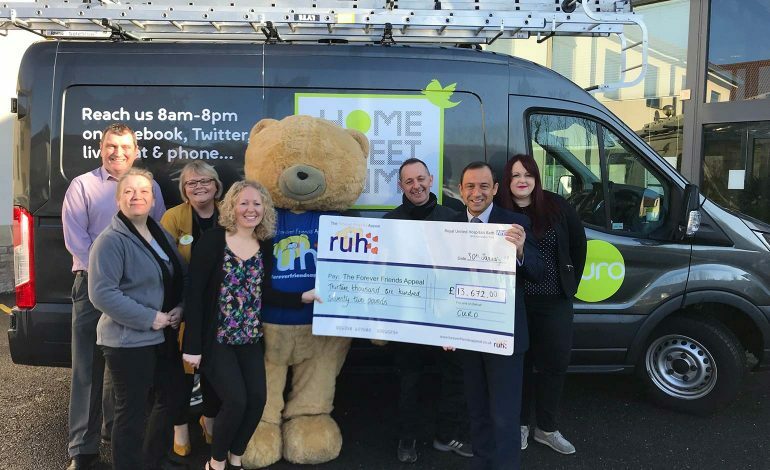 Bath-based housing association and house-builder Curo has raised over £13,000 for the new Dyson Cancer Centre, that will be built at the Royal United Hospital in Bath. Each year, Curo colleagues choose a ‘Charity of the Year’ and the RUH’s charity, The Forever Friends Appeal was nominated. Rachael Allen, Communications, Brand and PR manager, Curo said: “Choosing The Forever Friends Appeal as our charity of the year was an easy decision for us as we wanted to give something back to the RUH, its staff and patients in gratitude for the care given to our colleagues, friends and family. A Curo colleague who talks highly of the RUH and helped fundraise for the Dyson Cancer Centre is Stuart Dashwood, who works in their Lettings Team. Stuart, aged 50, from Bath, was re-diagnosed in December 2015 with Non-Hodgkin’s Lymphoma, a relapse from a diagnosis in 2009. He said: “I am eternally grateful for all the treatments, support, empathy and love extended to me over the last ten years – especially the last three years which have been the most challenging. “From January 2016 I received six sessions of chemotherapy followed by 18 months of treatment taking me through to spring 2018. I now go to the RUH for checkups every three months and despite aches and pains there are no signs of reoccurrence of Non-Hodgkin’s Lymphoma, which is fantastic news. “I have experienced the most amazing and empathetic care and have nothing but praise for all the team who have looked after me. “We are lucky to have the NHS. I have been offered lots of support throughout this journey from my amazing GP, the consultants in Oncology and Macmillan nurses. “When Rachael Allen heard that I used to DJ, she asked me to do a special one-off gig at our annual Spotlight Award Ceremony in aid of raising awareness to the charity – naturally I waived my fee and the evening was a huge success. “I also wrote a blog for my colleagues to read prior to the awards night to highlight the importance of The Forever Friends Appeal and that I am a real-life beneficiary of the RUH.